And I am here to steal your heart. My life's mission is to be loved by you. Is Cecil a boy's name or a girl's name? Either way you are adorable and floofy and you've stolen my heart. Oh! My! ... *swoons* I wonder if I can move across country quick enough?! I have totally lost my heart! Cecil!!!! Squeee! Cecil, consider my heart stolen. You remind of a delicious cream puff. K&K's mom, Cecil is a boy's name, pronounced either SEE-sill or SEH-sill depending on who you ask. And that is one handsome kitty boy. You're too young to have already achieved your life's mission, little man, but there it is. I've always loved a good Knapp. Adorable! IS Cecil a boy? I know it's usually a boy's name, but the very first person I ever knew named Cecil was a woman, who was a friend of my grandma. I've also known a Ryan who was a girl. Some people already have the name picked out when they learn the kid's gender, and never change it. Usually the feminine form of Cecil is either Cecilia or Cecily (I happen to like Cecily). Or Cecile (like the French version! Well, we can;t say we weren't warned! They said it all, already! me too. Creamsicle! What a sweetie. How many Knapps are there? That little forehead is just BEGGING to be kissed! I know a female Cecil. But I think it's usually a boy's name. So cute! I love ginger kitties. Oh, Cecil! You are such a precious little ball of floof -- don't worry, little man, you've already succeeded in your life's mission! Does he have a home yet? Mission well done, Cecil, honey! Sweet Cecil! My Honey B looked like him when he was kitten and everybody thinks he is a girl because he is so pretty. I'm sure the name I gave him doesn't help but I found him in a dumpster hiding in a box of Honey Bunches of Oats and is honey colored and he is as sweet as honey! ooooooooh. I didn't even realize I was sighing out loud. 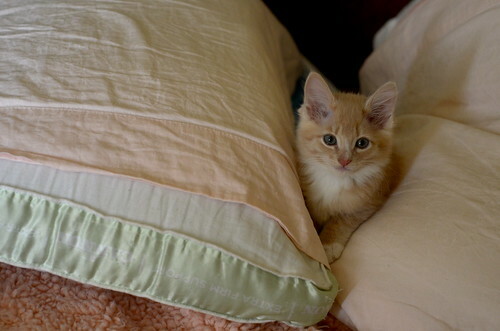 what a darling little kitteh. 28 comments already by 8:47 PST.. Yeah, we were ready for new kittens. :) And they ARE adorable. Can't wait to meet the rest of them! I gave an involuntary peep of pleasure when I saw him - those sturdy little legs! What an angel. I love all colors of kitties but I secretly love ginger kitties the most. 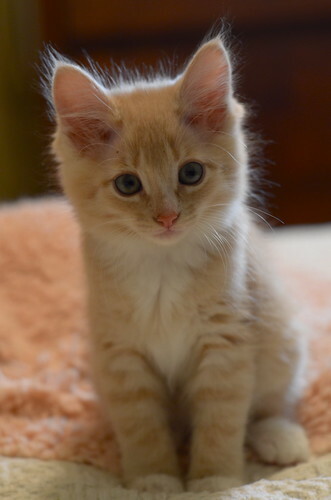 I don't think a kitten could get any cuter than this! Ooohhh... you're a darling! Heart is stolen. Oh my goodness - mission accomplished. I officially love you - you little kitty bitty! Hahaa! Ikr? I don't know how many hour(literally, HOURS)I have spent looking at cat pics and videos, and to have a BLOG just for cats? Can you spell heaven for me? Lol! Ohhh! I love your tiny fluffy self! What will I do without my heart now that it's been stolen by a sweet little kitty on the other side of the world from me? Mission accomplished, you sweet creamcycle fluffernutter! What are you going to do with all those hearts you've captured? mama cannot handle the cuteness overload and there's only two of you knapps she has seen so far. how many more is there? I sincerely hope this is a small litter or else my head is going to explode from the concentrated cuteness! I have only just recovered from the sheer cuteness of Cecil. Little boy with the creamsicle fur and blue eyes you have stolen our hearts. One heart for Wiley, and one for Cecil. How many more do I need to grow for this batch? Oh my gosh! Consider it stolen! Hearts at his tiny little feet! Charlene's going to hug this one to bits. What a cutie! Cecile, you stole my heart the moment I saw you. And I love you already. You can have snuggles by me any day of the week. Oooooo... You know how they have those polar bears in snowstorm t-shirts where only a black nose shows? Cecil is showing the equivalent of Cecil amongst matching bed linens except I'm melting in the face of his eyes and darker pink nose! Squee!!! OMG! My heart swoons for Cecil!! :) Wish I lived nearer. I honestly think I might die if I don't snuggle this little charmer. Squeee! No need to steal my heart, Cecil - it's yours! What a sweetheart. How many more? And steal my heart you have, Cecil! We have a very soft spot in our heart for orange and white floofies! Such a gorgeous buff beauty! He looks just like my friend Jane's boy Nigel. What a lovely boy you are.